Sometimes what you want to do just doesn't fit the mold. For instance, let's say you want to be alerted at work when someone trips a motion by the front door or a motion sensor by the back door, but your kids get off the bus at 4:00 and you only want to be alerted for abnormal activity. So you want it to pop up a message box on your computer at work if anyone approaches the front or back doors from 8:00 AM to 4:00 PM. It sounds easy enough. You just add a time trigger, and two sensor triggers, right? Close, but no cigar. The trigger when needs to be "Any Triggers Active (Logical Or)" for the two sensors so they trigger when either sensor is tripped, and you need "All Triggers Active (Logical And)" for the relationship between the time trigger and the two sensors. That way it will only trigger when it's time and when a sensor is tripped. That's where group triggers come in. In the example above, you would probably add a group trigger for the two sensors and add the triggers the same way you would in the main macro window. Then you would set Trigger When to "Any Triggers Active (Logical Or)". 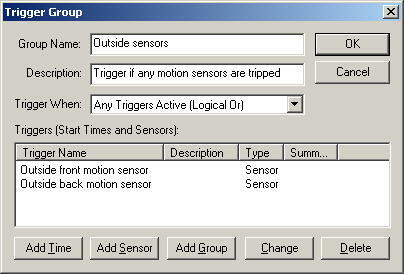 All of the triggers in the group are treated as one trigger on the window where the group trigger is added. Here's a mind bender: You can even add a group trigger as one of the triggers in a group trigger! Group Name - The group name is what's going to appear on the selection list where the group trigger was added, so pick a name that describes all the triggers that are in the group, just to keep yourself sane. Description - If you're a wordy person, you may want to keep your Group Name brief and add a little more detail here. This will show up in the selection list too. The rest of the items on this window are exactly the same as in the macro window, so if you have any questions on those, please click the link.